V0011. 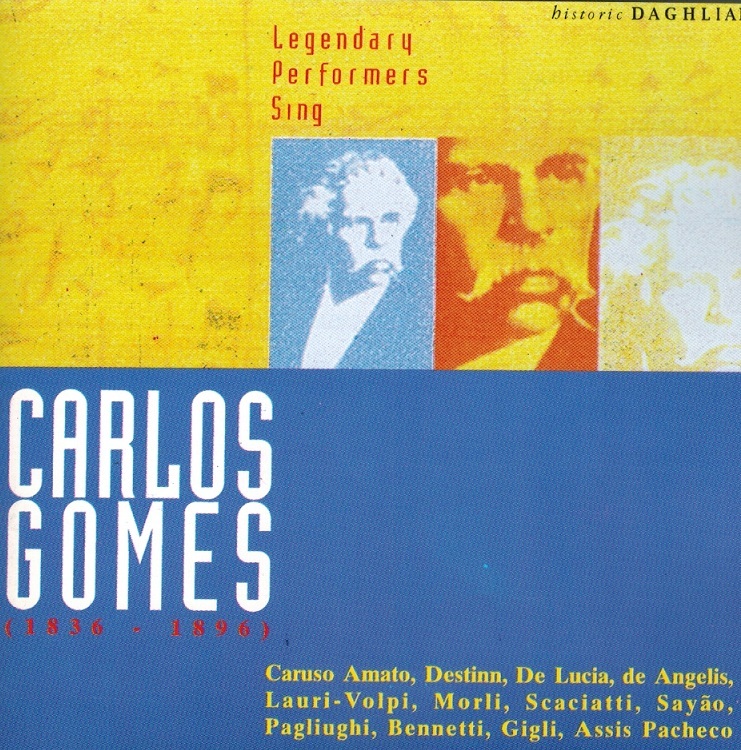 CARLOS GOMES - Legendary Singers, incl. 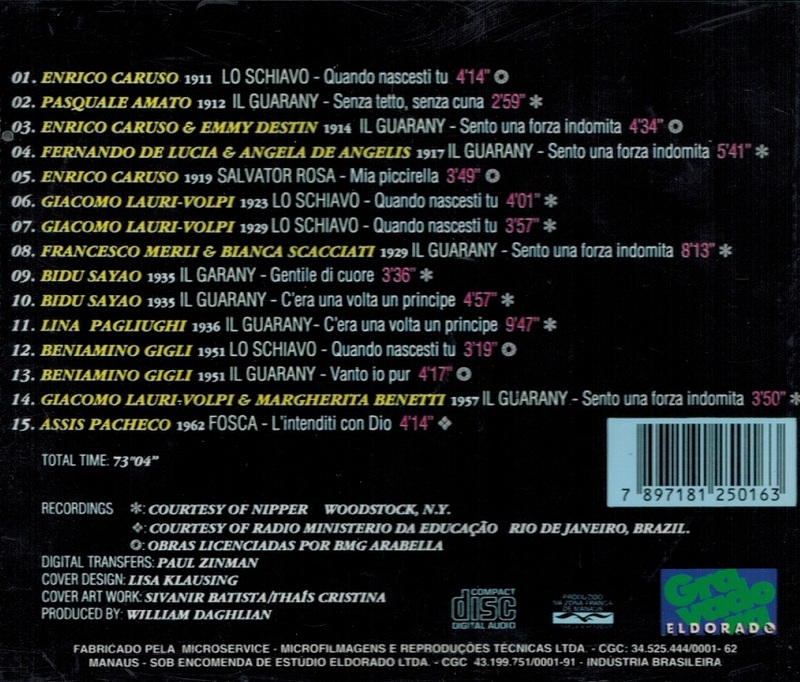 Caruso, Destinn, de Lucia, de Angelis, Lauri-Volpi, Merli, Scacciati, Sayão, Pagliughi, Bennetti, Gigli & Pacheco. (Brasil) Eldorado 935016, recorded 1911-62. Private Issue, Very Long out-of-print, Final Copy! “Antônio Carlos Gomes was the first New World composer whose work was accepted by Europe. The only non-European who was successful as an opera composer in Italy, during the ‘golden age of opera’, a contemporary of Verdi and Puccini. Younger than Verdi, yet older than Puccini, Carlos Gomes achieved his first major success in a time when the Italian audiences were eager for a new name to celebrate and Puccini had not yet officially started his career. 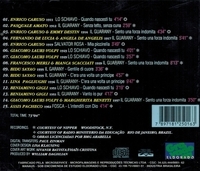 After the successful premiere of IL GUARANY, Gomes was considered the most promising new composer. After having graduated from the Musical Conservatory of Rio de Janeiro. with honors, Carlos produced his first opera, A NOITE DO CASTELO (1861). It was a big success. Two years later, he repeated it with his second opera, JOANA DE FLANDRES, which was considered superior to the first. These two pieces convinced the Emperor to offer him a Royal scholarship to study in Italy in 1864. He studied in Milan at the local Conservatory with Lauro Rossi and Alberto Mazzucato and completed in three years a course which was normally completed in four years, obtaining the title of Maestro Composer. Interested in composing an opera which dealt with a truly Brazilian subject, Carlos Gomes chose as the theme of his next work the romance novel O GUARANI, by Brazilian writer José de Alencar. The opera was given an Indian subject and setting and it premiered in May 1870 at the La Scala Theater in Milan as IL GUARANY. The success was enormous. Even the most strict musical critics compared the Brazilian musician to the great European maestros, such as Rossini and Verdi. The King of Italy, Victor Emmanuel II, decorated the creator of the opera which was presented in all major European capitals. Before that year was over, Gomes returned to Brazil where he organized the premiere of IL GUARANY in Rio de Janeiro. The piece achieved the same success Gomes had seen in Italy.